america: The Shah of Iran was toppled by the CIA and MI6? The mainstream media would like us to believe that the Shah was overthrown by People Power and that the CIA and MI6 were taken by surprise. However, there is evidence that the CIA and MI6 toppled the Shah because he had become too much of a nationalist, like Nasser, and was not following instructions on oil or even opium. The CIA did not want left-wing democrats taking over from the Shah as they might not be easy to control. So, reportedly, the CIA allowed the Ayatollahs to take over. Radio Free Iran claimed that while at Qom, the Ayatollah Khomeini received a "monthly stipend from the British, and he is in constant contact with his masters, the British." On 19 January 1980, the International Herald Tribune reported that the Shah had said, two years before he was overthrown, that he had heard from two different sources connected with oil companies that the regime in Iran would change. The Shah's nationalist policies were making him more popular in Iran and making his country more independent and more powerful. This worried the CIA and MI6. 1. The Shah bought land from the upper classes and, along with the crown's own land, sold it back cheaply to tenant farmers. Over one a half million people to became land owners, thus ending the old feudal system. 2.The Shah allowed women the right to vote. He brought an end to the wearing of the veil. 3. He developed plans for a $90 billion nuclear power program. 4. The Shah signed petroleum agreements with ENI, the Italian oil company. 5. He began to close down the opium industry. This had been created during the days of British influence. 'Former intelligence officer' Dr John Coleman considers opium to be of prime importance in the toppling of the Shah (Conspirators’ Hierarchy: The Story of the Committee of 300 - 6). Dr Coleman is sometimes described as being a conspiracy theorist. Coleman believes that the US government toppled the Shah of Iran. Why was the Shah deposed...? In a word, because of DRUGS. The Shah had clamped down and virtually put an end to the immensely lucrative opium trade being conducted out of Iran by the British. At the time that the Shah took over in Iran, there were already one million opium/heroin addicts. This the British would not tolerate, so they sent the United States to do their dirty work for them in terms of the “special relationship” between the two countries. After 1984, Khomeini’s liberal attitude toward opium had increased the number of addicts to 2 million, according to United Nations and World Health Organization statistics. The arms trade with Iran was sealed at a meeting between Cyrus Vance... and Dr. Hashemi, which resulted in the U.S. Air Force beginning an immediate airlift of arms to Iran, carried on even at the height of the hostage crisis the arms came from U.S. Army stockpiles in Germany and some were even flown directly from the United States with refueling stops at the Azores. With the advent of Khomeini... opium production skyrocketed. By 1984 Iran’s opium production exceeded 650 metric tons of opium per annum.... Iran presently rivals the Golden Triangle in the volume of opium produced. The most noteworthy success of the Islamic movement during this time was of course the overthrow of the Shah of Iran and the installation of the Ayatollah Khomeini as the Islamic dictator. British Intelligence had used their contacts with Iran's mullahs and ayatollahs to help overthrow Mossadegh and install the Shah back in 1953, and these contacts were maintained and used again to overthrow the Shah when his regime fell out of favor. The Establishment history of Iran's Islamic Revolution is that Khomeini's revolt was spontaneous and populist, and that it overthrew a repressive dictatorship that was hated by the people but supported wholeheartedly by the United States. It is true that the Shah's government was not a democracy and that his secret service, trained by the CIA, was one of the most effective intelligence organizations in the world. But what is not reported is that prior to the British-sponsored massive public relations campaign on behalf of the Ayatollah the government of the Shah was loved by the vast majority of the population. After taking over from Mossadegh the Shah began to push forward a number of nationalist policies that increased his popularity at home but, in some cases, worried the Anglo-American Establishment. First, he signed petroleum agreements with ENI, the Italian oil company. Then in 1963 he pushed forward on a series of popular reforms that became known as the White Revolution. - He bought land from the upper classes and, along with the crown's own land, sold it back cheaply to tenant farmers, allowing over one a half million people to become land owners and ending the old feudal system. - He allowed women the right to vote, and brought an end to the wearing of the veil, which were "Westernizing" moves unwelcomed by the religious sector. - He pushed forward on a $90 billion nuclear power program. Dr. John Coleman, a former British Intelligence agent... states in his report on Iran's Islamic Revolution (11) that the Muslim Brotherhood was created by "the great names of British Middle East intelligence" ...and that their mission was to "keep the Middle East backward so that its natural resource, oil, could continue to be looted..."
Dr. Coleman writes that in 1980 the broadcasts of Radio Free Iran divided the enemies of the Shah into four categories: 1. Iranian politicians bought by the Israeli Shin Bet, 2. The CIA's network of agents, 3. The feudal landowners, 4. The Freemasons and the Muslim Brotherhood (viewed as the same enemy). In his report Dr. Coleman writes that in Iran, "At one time there was even a joke about the mullahs being stamped 'made in Britain.'" When the Shah introduced his plan for modernization in 1963 the Ayatollah Khomeini emerged as the leader of the religious opposition. 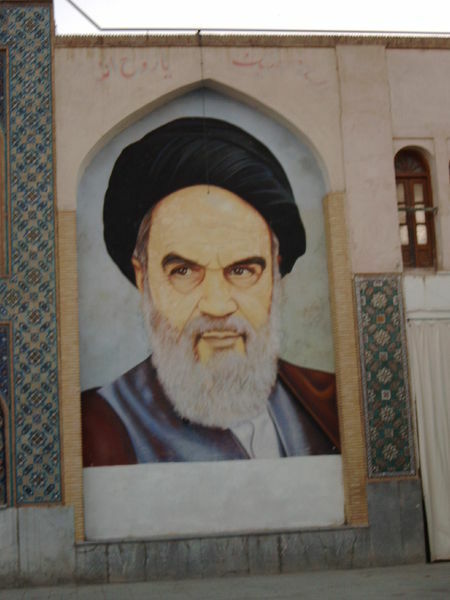 Up until his exile from Iran in 1964, Khomeini was based at the religious city of Qom. Dr. Coleman relates that Radio Free Iran claimed that while at Qom Khomeini received a "monthly stipend from the British, and he is in constant contact with his masters, the British." On February 1st, 1979, two weeks after the Shah's departure, Khomeini made a triumphant return to Iran. The BBC's John Simpson was on the plane that carried him back from Paris. aangirfan: BBC links to MI6? 103 min - google video.